Facts and history about the life and lifestyles of Native American Indians. The American Indian Flute, also referred to as a Courting Flute, is a woodwind musical instrument, often made from cedar wood, the stalk of a plant, cane or bone, Flutes were end blown, rim blown or side-blown (transverse). The flutes had holes that were stopped by the fingers and the number of holes varied depending on the tribe and the preference of the flute maker. Some flutes were highly ornate and had carvings of bird, reptile and animal heads on the end. 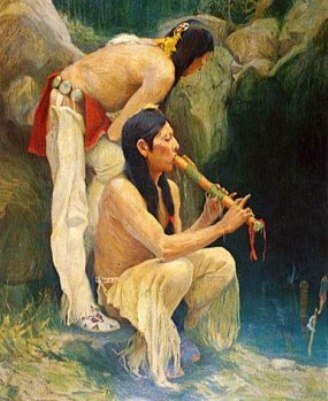 The Native Indian Flute was played without accompaniment in various situations and circumstances including healing ceremonies, courtship, meditation, and spiritual rituals. The Life and Lifestyle of Native Indians is a varied and fascinating subject. The following fact sheet contains interesting facts and information on American Indian Flute. For additional facts refer to Native Indian Drums and American Indian Music.